Cantor’s Driving School offers driving lessons and driver training in all areas of Chandler, Arizona. Over 50,000 drivers have learned to drive with Cantor’s Driving School. Are you our next safe driver in Chandler? 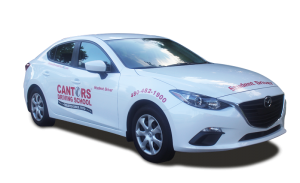 Cantor’s – The Driving School That Gets Results® in Chandler. When taking driving lessons in Chandler, Cantor’s Driving School provides driver training on main roads such as Price Fwy / AZ 101, S Arizona Ave / AZ 87, and Santan Fwy / AZ 202. Driving lessons can be conducted on local roads in Chandler like Chandler Blvd, Germann Rd, Queen Creek Rd, Chandler Heights Rd, Octillo Rd, Riggs Rd, McQueen Rd, Queen Creek Rd, Alma School Rd, Ray Rd, Warner Rd, Elliot Rd and Pecos Rd. The Chandler areas covered include Nantucket Village, Sun River, Monterey Vista, San Marcos Estates, Fairview Meadows, Silverton Ranch, Brittany, Sienna, Pecos Vistas, Island at Ocotilla, Balboa Way, Symphony II Estates, Creekwood Ranch, Riggs Ranch Meadows, Barrington, Saguard Canyon, Springfield Lakes Reflection, Sun River, Sun Groves, Shadow Ridge, Colonial Coronita, Superstition Ranch, Stonegate Crossing, Hacienda, Oasis, Woodglen, Old West Manor, Cambric Courts, and Downtown. Teen drivers can be picked up at any of the public or private schools in the Chandler area, including Chandler High School, Chandler Preparatory Academy, Hamilton High School, Blueprint High School, El Dorado High School, Hamilton High School, Basha High School, Mesquite High School, Mosaica Preparatory Academy, Seton Catholic Prepatory, Valley Christian High School, Tri-City Christian Academy, Cenpatico Schools and Brightmont Academy. Zip codes covered include: 85224, 85225, 85226, 85244, 85246, 85248, 85249. Cantor’s Driving School serves the Chandler Arizona area. To get started with driving lessons, call us at 480-482-1900 or use our convenient contact form.